I emailed my mother to get her cranberry relish recipe, the one my husband and I descend on like a pair of hungry fruit bats each year. She emailed me the recipe, but what she sent didn’t quite match my memory of the dish because I thought it had apples in it. By the time I got the recipe, she and my dad were on the road to Texas, to visit my sister. And though my parents finally broke down and bought a pre-paid cell phone, they rarely turn it on, so I was stuck. I decided to make it with the apples, just because I couldn’t see what it would hurt. My mom said to prepare this a couple of days ahead of time because it gets better over time, so I made it this afternoon. Wow! I don’t know if we’ll be able to keep our hands off of it until Thursday. I suppose that relish was traditionally meant to complement the turkey (or add flavor to it if you ask me, not a turkey lover even in my omnivore days). But to me it makes a great side dish. Or even a dessert. I can just imagine it over some vanilla soy ice cream. Mmmm. Stop me before I descend on the fridge! UPDATE: I took my version of this dish to my parents’ house for Christmas, and my father told me he had never added apples because he likes to make a lot and freeze it. But he admitted that my relish with apples was delicious. Success! 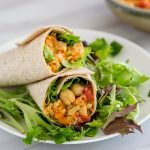 Speaking of Thanksgiving–if you’re looking for more vegan Thanksgiving recipes, check out my master list of Thanksgiving recipes! There’s everything from main dishes (like Thanksgiving Loaf) to side dishes (like Green Bean Casserole) to desserts (like Double-Layer Pumpkin Cheesecake). The secret to this unique relish is using whole oranges--skin and all. Try to find organic ones. Wash the cranberries and remove any stems, bad cranberries, or inedible stuff you find. 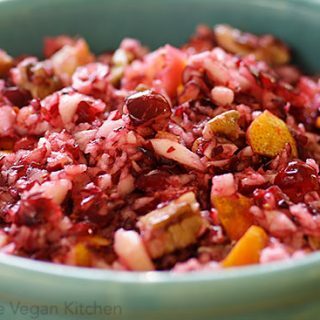 Put half of the cranberries, orange (unpeeled), and apple into the food processor and pulse to chop coarsely. Some larger pieces are okay, but nothing big enough to choke on. Pour into a bowl and process the other half of the fruit. Put it into a bowl, add the sugar to taste, and mix in the pecans. Refrigerate it for a day or two to allow the flavors to develop. Quick! If you start now, it’ll be ready by Thanksgiving. After I posted this, my father let me know that they never put apples in it because they like to freeze the leftovers and were not sure that the apples would freeze well. So feel free to leave out the apples, though I think they add sweetness and allow me to cut down on the amount of sugar I use. Just wanted to chime in and say this will be the third Thanksgiving that your family's relish will be on our table. We just love it. The first two years I served it alongside with the usual cooked relish, as I knew some members might not like raw and some wouldn't like orange. This year, we don't care who doesn't like it and this is the only one on the table. My batches make a generous two pints, and I just ate the amount that didn't fit it the jars on top of Greek yogurt. Truly amazing flavors, even when freshly made. Thanks so much for contributing to our family traditions! I made this for Thanksgiving. It was a perfect cranberry relish. It was so good that I ate it by itself as a salad. Yummy! Been making a relish that is virtually the same for years. We use a can of frozen apple juice as sweetener, tangerines and whatever apples are on hand. I tend to try to forage for fruits for the holiday meals and happen to have a tangerine tree. This year I will add persimmons to the mix too!. In any case, I also use agar agar to make it thicker- we get long strings of it from an oriental food market- cut up and melted in the warm “stew”, it thickens up very nicely. EXPERIMENT and make your’s one of a kind! I made this on Monday for our Thanksgiving dinner yesterday….it was great! 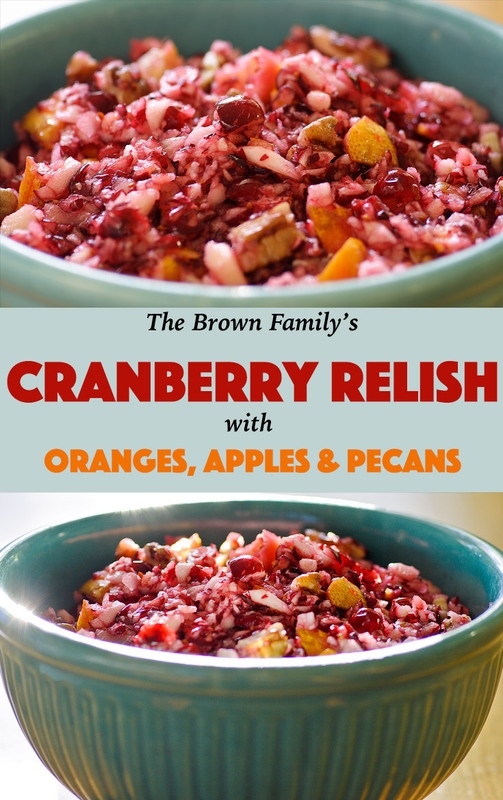 So much better than boiled cranberry sauce. I would probably use a small orange next time, but otherwise it was perfect. I used 1/2 cup of turbinado sugar and after a few days in the fridge, it was plenty sweet. Thanks for a great recipe! I just wanted to say I made this recipe for Christmas and it was absolutely delicious. 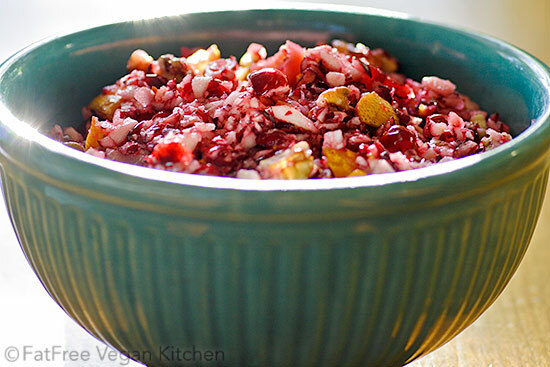 I never thought I liked cranberry relish before I made this. I used 1/2 cup sugar. 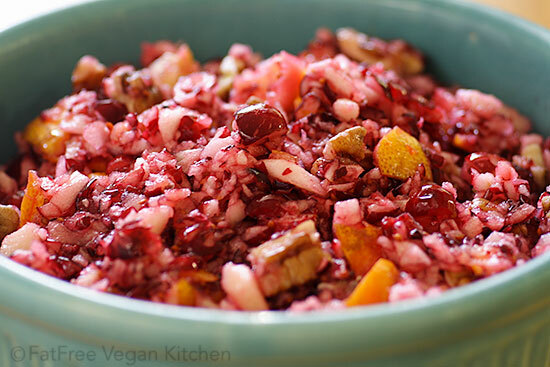 What a great way to use the bounty of Cranberries we have in Oregon! I will be using this recipe every year for Thanksgiving and Christmas. Thanks for the recipe! This looks so good! Do you think date paste would be an okay substitute for the sugar? i am nervous about uncooked… won’t the cranberries be too sour? is there a way to find sweeter cranberries? the one time i made a cranberry sauce it was cooked in sugar but so incredibly sour. also will the apples go brown / look yucky if i make this two days early? The orange helps keep the apples from going bad. I’ve kept it for several days and haven’t noticed any change. And the cranberries are tart, but the added sugar can be adjusted to taste so that it can be quite sweet if you want it to be. I don’t use apples, I use mandarin oranges and crushed pineapple in addition to the cranberries! I am surprised that the peels are left on the orange. How does this taste. I have always heard that orange peels are bitter. I want to make this for my families Thanksgiving, but I need assurance that the unpeeled orange is a good idea. Thanks for this website, it is wonderful. Somehow the orange peel works. My family has been making it this way for years, and everybody loves it. I would only use oranges that have a regular to thin rind, though, like a naval orange. I just serve it like cranberry sauce as a side dish alongside the typical Thanksgiving dinner: mashed potatoes, cornbread dressing, green bean casserole, and something “protein,” like tofu, seitan, or lentil loaf. We eat it on biscuits, dressing/stuffing, turkey, and pita chips as an appetizer. It’s great on everything. Not sure about this, but could you use agave instead of sugar? Yes, just add it to taste. I made this relish for Thanksgiving and it was perfect! My apples and orange were very sweet so I only needed 3 tablespoons of sugar. Everyone love it and it was healthier than my usual cooked cranberry recipe that uses at least 1 cup of sugar. Thanks!!!!! I am so very thankful to have found this recipe!! My mother used to make this, and now has Alzheimer’s, so I thought the recipe was gone for good. Thank you for posting!! This is my very favorite!! Happy Turkey Day to you and yours!! is there a certain kind of apple you use? one that is sweeter? I like Fugis and Honeycrisps, but really, you could use whatever apple is good in your area. Hope you enjoy it! OMGOSH!! 🙂 this is so amazing! the whole family loved it for Thanksgiving. I’m making another batch now ! Thank you for such amazing recipes! This is the first time I’m making this….oh, boy! It’s really delish…and it hasn’t even marinated in it’s own juices yet…..TRULY INSPIRING!!! And, Susan, you are in my prayers….I will keep you there until the words “ALL CLEAR” come across the miles!!!! Thanks for all you do, and your courage to share your story! ok, I made this for Thanksgiving and loved it so much I made more today! I just stand there eating it out of the bowl! 2 questions: 1 do you think you could freeze this? And second, I wonder about adding some fresh ginger for a kick. It freezes well without the apple, but I’ve never frozen it with the apple because I was afraid it would become mushy. You could always add apple after defrosting. And I think ginger is a great idea. Glad you loved it! hi susan…..just curious, is there anything to use instead of sugar that would blend in the food processor? have you tried anything? thinking without something, it may be too bitter/tart??? i love the recipe….it’s amazing! just trying to avoid sugar! This is very close to the cranberry relish I got addicted to about 20 years ago and have made every year since. My recipe omits the nuts and adds in frozen unsweetened raspberries. I only use one granny smith apple. I never worried about freezing leftovers – what leftovers? Did I miss something – it says cooking time 1 minute but I don’t see any cooking in instructions. I discovered this recipe last year at Thanksgiving and was thrilled because it was exactly what my Grandma made so many years ago and I never got the recipe. I made it again this year and we were, once again, delighted with it! 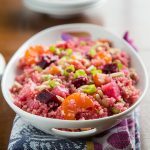 I began watching my carbs this year, so this time around, I used a little less than 1/4 cup of Xylitol and though it’s more tart than sweet, we like it that way and loved having a lower carb version–I’m sure I used close to a cup of sugar last year. Thank you so much! Susan, I make this relish every year and it is always a hit. As I was preparing it today, my housemate exclaimed that it’s the best thing I make! All credit goes to you, of course. It’s a winner of a recipe. I’m doing a vegan cooking class for Holiday meals. May I use this recipe if I include your website and name etc? It’s for a class at our church. I’m not making any money, it’s not a business. Of course! All I ask is you don’t publish it. 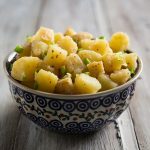 I’ve used this recipe for years-it came to me from my father-in-law who grew up in MA where it was a staple for holidays. 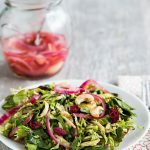 I have changed it to include chopped celery for crunch and sometimes a little cream or creamy coleslaw dressing for a different flair. I’ve been making this recipe since I was 11 years old,it was my chore each Thanksgiving and Christmas , but I make it all the time now, it’s not for special meals it’s any time I need a fix, 🙂 I’m now 77. I made this for Thanksgiving 2017 and in addition to the above ingredients I added a tsp or so of cinnamon and a touch of burbon (about a tbsp), went by taste as I didn’t want the extra flavor to stand out. It was exceptionally tasty. My husband and I pared down our Thanksgiving cooking this year, so I skipped the cranberries. I saved this recipe though, and just made it today as a fruit salad to enjoy. I omitted the sugar, just because, but would probably leave it in for most palates. Thanks for another great recipe! I made this delicious recipe. I only added 1 Apple but I added flaked coconut at the end. Very delicious! Wow. This is so good and fresh! Whipped it up in no more than 15 minutes! Followed the recipe but used DIY date paste I had previously made instead of the sugar. No sitting to enhance flavors with mine. Made enough though we’ll have leftovers to top dessert or oats. Thank you, Susan!